Cr Jessica Cosgrove addressing last week's council meeting. DEPUTY mayor Jessica Cosgrove has apologised for a social media post criticising local businesses over a petition. 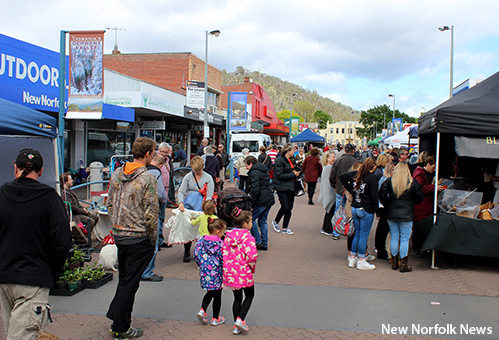 Cr Cosgrove told last week’s Derwent Valley Council meeting that she had felt threatened by the petition from local shops, which asked for New Norfolk’s High St market to be relocated to Arthur Square. Local business owner Wayne Shoobridge was at the council meeting on Thursday night to challenge Cr Cosgrove’s online comments but said he respected her decision to apologise. He said he would still like to know how Cr Cosgrove could justify a statement that she was a High St ratepayer. General manager Greg Winton said the council's licence agreement with Cr Cosgrove for the market included "a figure that the council charges the market operator which was calculated as an equivalent of rates," but added that this was not invoiced as a rates notice. Later in the meeting, community member Diane Cowburn asked about a $30,000 budget allocation to provide support to the market. “As a private business the market owner should pay the cost of council employees who set up bollards to close off the streets. That is two people by two shifts, paid a minimum each of four hours each shift,” Ms Cowburn said. Ms Cowburn said businesses in the town centre had been negatively impacted by the market and did not receive in-kind support from the council. Mr Winton responded that the council had decided to provide the support Ms Cowburn had described. “There is a budgetary provision this year to put in some drop-down bollards and … when they are installed that will be reduce the requirement for that staff time,” Mr Winton said. The New Norfolk Market in High St.
Cr Cosgrove said some businesses might claim to be suffering because of the market - which closes a section of the main street each Saturday - but others were completely supportive. "That's a pretty open statement to say that businesses in the New Norfolk High St are significantly affected by the market," she said to Ms Cowburn. "There may be some who claim to be, but I can also honestly tell you ... to those people that are disgruntled and are suffering or making statements that they're suffering, there is also many businesses who ... are completely supportive of the market operating on a Saturday morning." 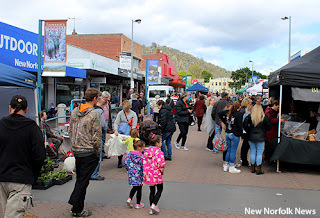 "I've also had businesses choose to do their grand opening on market day because they would like to take the opportunity to buy into the amount of people that are frequenting High St on a Saturday morning," Cr Cosgrove said. "I have been told another business has their best sales days on a Saturday when the market is opened. Now they are all willing to provide evidence or back that up." Since the establishment of the market about 18 months ago, some shop owners have expressed concern about the road closure and individual stalls blocking access to their businesses. The petition - a letter signed by about 20 business representatives - asks for the market to be moved to nearby Arthur Square but it has not yet been tabled at a council meeting.